Long before David Attenborough seduced us all with his dulcet tones, art and science were inextricably linked by the use of scientific illustrators to provide visual records of each new discovery. Though the earliest examples were often comically inaccurate, having been drawn from second-hand descriptions or dead specimens, it ultimately became a highly technical profession. During a time of intense scientific activity, from the Age of Discovery right through to the Enlightenment, illustrators were as venerated as the scientists they worked alongside, with artists like Mark Catesby, John James Audubon and Edward Lear (incidentally the author of children’s poem The Owl and the Pussycat) household names. Some, like Catesby, amassed so much knowledge from their illustration work that they became naturalists in their own right, further blurring the professions. As photography and printing technology improved, the need for illustrators lessened, but the images they produced remains some of the rarest and most fascinating of objects held in the world’s museum collections. It is impossible not to be struck by the detail of these early studies, each one a hand-coloured masterpiece in gouache or ink. The time and skill required to produce an illustrated journal was extraordinary to contemplate back then, let alone when viewed in the context of today’s digital world. Much as I love Attenborough’s documentaries, with their super high definition and special effects (and that voice of his), there is something missing, something inorganic and lacking in wonder, when compared to a 500 year old bound book of taxonomic illustrations. Such precise work makes you stop and contemplate every brushstroke, every line and every area of shading. It is a moment of reflection that doesn’t exist when we’re watching The Private Life of Plants, or flicking through a copy of National Geographic. Two recent exhibitions, by artists Emma Lindsay and Victoria Reichelt, brought this point home to me very clearly. 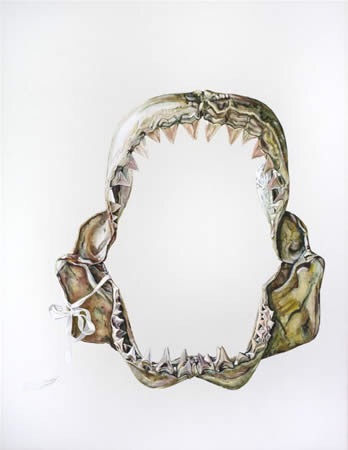 Both realist painters, they explore the extinct and endangered in the social and natural worlds via their research into common cultural practices. Emma Lindsay’s work pays homage to the early biological illustrators with her use of white space and intense detail, but differs in that its intent is not the wonder of discovery so much as what has been lost to wilful destruction. Inspired by museum specimen collections, Lindsay began what she calls The Extinction Project, a series of studies that highlight animals now gone or in peril due to human interference in the world’s ecosystems. Museum specimen stores can be a fascinating sight, with row after row of unique wildlife represented. But the damage that is also represented by such a collection is a tragedy matched only by the fact that newly extinct species continued to be added to the list, even now. The Natural History labs are kind of the Found & Lost department of the museum. By focusing on the creatures of the current Anthropocene, Lindsay ensures the work remains contemporary both in style and topic, however the conventions of taxonomic illustration are never far from the viewer’s mind. Lindsay’s careful application of glazes and impasto creates a haunting replication of traditional museum displays, evoking the eerily lit dioramas of taxidermied animals we regularly see in Natural History museums. As Lindsay’s body of work reminds us, this is as authentic an encounter as we can hope to experience with an increasing number of creatures. Animals feature intermittently in Victoria Reichelt’s work too, though they exist more as a reminder of the parallels between humans and beasts and their changing habitats. With digitisation and robotics making people redundant in ever increasing ways, Reichelt sees humans as the hunted – and the sites of current human engagement as the Future Ruins created by that redundancy. Traditional institutions are increasingly threatened as people elect to inhabit the virtual world. Collections are online, books are in e-Readers, and google image search has the world’s artwork at your fingertips. As a result, our libraries, archives and museums are on the cusp of insignificance. If the creatures in Reichelt’s deserted landscapes look a little startled by their surroundings, it is only a precursor to how future generations may also view the remnants of our cultural foundations. The most compelling of Reichelt’s works, however, are the ones devoid of any life at all. Scenes of the future epoch, where traces of people exist in ghostly ways. A shelf of archive boxes with handwritten notations, a drawer of catalogue cards left open as though the librarian had mysteriously vanished, an office chair without the body it ordinarily supports. These are canvases that reflect my own experience working in museums back to me, alone in the Collections store, surrounded by the spooks of our collective history. Like Reichelt and Lindsay, I can’t help but question what is to become of the world’s collections. I wonder if we haven’t relegated objects to a place even worse than oblivion by keeping them locked away in perpetuity. Sure they’re safe from harm, but is an eternal shelf life any better? At work I’m surrounded by languishing history, useless and unappreciated, kept on the off-chance it will be considered relevant in the future. A fraction of our collection will be displayed at some stage, but the vast majority is destined to remain unseen. No wonder it feels a bit creepy in the stores – too many untold stories. The objects become like headstones in a graveyard called The Past. Preserving our history is important, but actively engaging with it is potentially more so. Perhaps today is the future we were keeping it for. I began this piece with the antique art of scientific illustration, and what little use today’s world has for such a skill. But the work of Emma Lindsay and Victoria Reichelt makes me believe that this one dying art might just be the thing to help conserve another. Take the time to study these works. David Attenborough might not be narrating, but the stories are still worth hearing.